By the end of 2019, the National Archives and Records Administration (NARA) will require all U.S. federal agencies and any state or local government that is required to submit documents to the federal level to meet stringent new standards for electronic records management. This includes a requirement that all agencies manage their records electronically to the fullest extent possible, with long-term plans to stop accepting paper-based records and archives completely by 2022. For most government agencies, this deadline adds new pressure to ongoing efforts aimed at transitioning from paper-based to paperless records management. 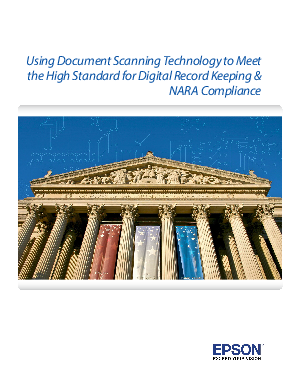 While a number of them have at least begun the early planning stages of transitioning to digital records, few have met the new standards for full document conversion that will soon be required across the federal government. Learn in this white paper what new regulatory standards must be implemented into daily operations, and how to properly identify and acquire the right document-scanning hardware to facilitate this transition.